As a physical therapist, high school distance runners have been my biggest population of clients and patients. Whether dealing with a running related injury, or coaching them on the performance enhancement side, I have had the privilege of watching young runners of all different abilities develop throughout their high school career. It’s no secret that high school running injuries are common. If this was not true, I wouldn’t have my business. Injuries are complex and challenging, but those rates should be less. With all that we know now about health, injuries and performance, what should we be establishing with high school runners so they can have a successful high school career and a healthy relationship with running as an adult? To get better at running you need to run. Plain and simple. If you are not running on a consistent basis you are not going to get better. A huge component of seeing consistent improvements in a runners times is dedicated training over many weeks, months and years. This is also your best bet to stay healthy. Aside from consistent training, and adequate recovery, incorporating strength training into a running routine is your best bet for decreasing your risk of getting hurt. Not only does it help with decreasing our injury risk, improved our performance as well. 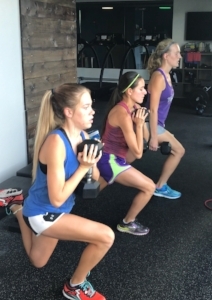 Over the last few years, I have been able to work with many high school runners, in team, small-group, and individual scenarios to help them incorporate strength training with their training plan. This has included training at my studio with access to dumbbells, barbells, kettle bells and lots of other nice equipment. It also consisted of training teams on a football field, trail or in someone's home. I reference this say that beginning lifting does not require elaborate equipment or access to the best facilities. It requires attention to detail and focusing on the basics. When a runner first begin lifting, the focus should be solely on getting them stronger. Not stronger in that they can do a lot of reps with some light weight, but actually STRONG. This does not necessarily create immediate improvements in someones running abilities, but it sets the stage by providing a solid foundation of muscle strength, architecture and efficiency as we progress towards more demanding exercises in the future. If there is one common error I see high school runners display when they begin lifting, it is that they have a poor understanding of how to control tempo of a lift. They try to rush everything. When we begin a lifting routine, the purpose is to place the body under tension for an extended period of time so we can force it to get stronger and more robust. We are trying to build up its ability so it can deal with the demands of training and racing. In order to help with this, I often implement two things with beginners. Giving them a prescribed count for both the eccentric (lowering) and concentric (returning to start position) portions of the lift. They can not rush through the movement. By making them hold a short, isometric contraction in the lift, they are again forced to maintain tension and challenge the target tissue. By implementing these two options with our lifts, we force the runners to "own" the movement and keep control throughout various positions. This places tension throughout the muscular system for longer periods of time and helps us foster the adaptations we want from lifting. It helps the runner maintain good mechanics as we apply greater loads as they progress. When it comes to prioritizing what we should be including in a runner's routine, foam rolling and stretching are near the bottom of the list. Foam rolling, and many other modalities, are fine to include in training as long as they do not take time away from the more influential training elements of training, recovery and lifting. The problem I have is when the amount of time spent stretching or rolling is anywhere close to the amount of time working on dedicated lifting. I often see these done at the expense of something that would be more beneficial. One of the hallmarks of a runner having a successful high school career is gradual improvement over a four year span. They build mileage, strength and intensity as they change from a 14 year old youth to an 18 year old adult. We should see the same progression in the weight room. We have to be pushing the needle over time to see improvement. That means freshmen and seniors should not be on the same routine. We should be grooving proper technique and building robustness as underclassmen that transitions to expressing strength and power as seniors. We should approach crafting the lifting plan and progression with the same level of seriousness we approach a runner's training plan throughout a season and high school career. Here's a sample routine of a two of my current clients. One is a "beginner" runner and the other just finished high school and will be continuing her running career in college. This video highlights a sample, beginner routine that challenges the runner through various planes of movement, cycles through running specific postures, and challenges the entire body in order to eventually progress into actual weight room sessions. It requires minimal equipment and focuses on precision with the various movements. This is just the beginning. Bodyweight, or minimal external resistance, should not be the end point with a strength program. While improvements can certainly be made with this type of programming, this should not be the end point. Our next post will highlight how to take runners into the weight room and progress them like you would any athlete looking to stay healthy and improve their abilities.